Chudney Smith began writing professionally in 2010. She is a certified lifestyle and weight management specialist, group-fitness instructor and personal trainer specializing in training novice exercisers. Smith has a Bachelor's of Arts Degree in Psychology and is currently studying for her Master's in Public Health. Will You Lose Weight Walking for an Hour a Day? A well-rounded weight loss routine includes both a healthy diet and regular exercise. However, fitness professionals often debate on what time of day to exercise is best for weight loss. 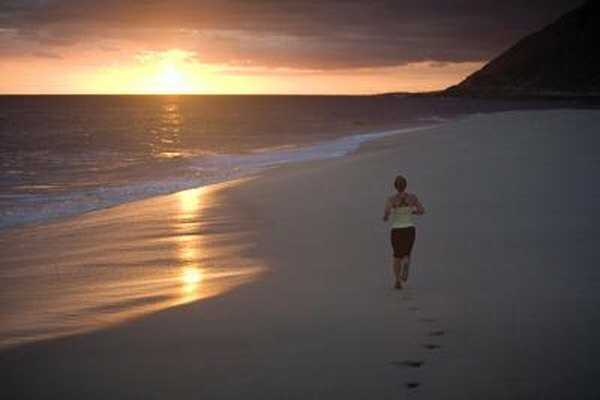 Some may argue that morning is best, while others may favor mid-day or evening exercise sessions. Regardless of the time of day, burning fat and becoming healthy should be your focus. Did you know that you have an internal clock, or circadian rhythm that guides your daily life. According to the American Council on Exercise, this circadian rhythm regulates your body temperature, metabolism and blood pressure, which are factors that may affect your workout. Later in the day, body temperature is usually its warmest and your strength is at its peak. Your muscles will also be warmer and more flexible, leading to better performance and more powerful and effective exercise sessions. More effective exercise sessions can help you burn more calories and achieve more successful weight loss. Calculating circadian peak can help you determine what time of day your body temperature is highest. To begin, record your body temperature every couple of hours for five to six days. It is important to accurately record the temperature readings because circadian rhythms may re-regulate daily according to the environment. Once you have determined the time of your highest temperature reading, the American Council on Exercise suggests working out within a three-hour window before or after that time. Working out in the morning may offer you the convenience of getting your exercise out of the way. This may alleviate worry of distractions occurring and derailing your workout plans during the day. Due to decreased body temperature, morning workouts may require a longer warm up. Taking the time to properly warm up and stretch may help prevent injury and maximize the weight loss benefits of your workout session. Experts agree that working out any time is better than not exercising at all. Whether your goal is to lose five or 50 lbs, the trick is to make physical activity a habit and find activities that you enjoy and will most likely stick to. Besides weight loss, regular exercise can help improve your mood, help combat chronic diseases, promote better sleep and boost your energy level. Work schedules, family life and social activities may pose a challenge when scheduling exercise. However, making exercise convenient is the key to weight loss success. The Centers for Disease Control and Prevention suggests splitting your workout into three session over the day if it's more convenient. Increasing the speed of performing chores may increase your heart rate and help sneak in a few additional minutes of exercise. Other suggestions include joining a local sports team, signing up for exercise classes and planning active outings such as hiking and biking. How Often Should I Use the Treadmill? Can Exercise Affect Your Menstrual Period? How Much Weight Do You Lose If You Do 20 Sit-Ups a Day? What Is the Best Weight Loss Exercise for Beginners? Does Music Affect Your Heart Rate During Exercise?